Ascending Butterfly: Wordless Wednesday - Meeting Cooking Mama! 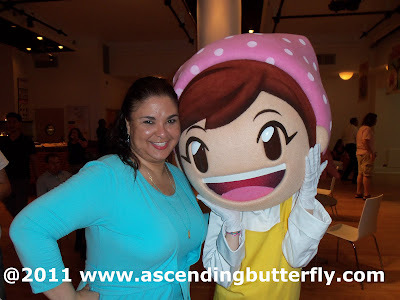 I thought I'd make my Wordless Wednesday a picture of me meeting Cooking Mama at Majesco Entertainment's Holiday 2011 Preview Event! And yes Butterflies, this does mean some fun gaming surprises are coming your way! Special Thanks to Patty @ADayinMyNYC who snapped this shot! I personally think Patty should go 'pro' and become a professional photographer, check out her awesome blog! So cool. My four year old loves the Cooking Mama games!